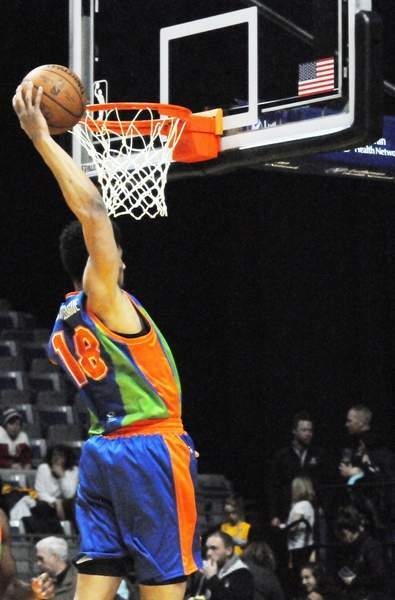 Justin A. Cohn | The Journal Gazette Mad Ants rookie Alize Johnson prepares to drive around the Windy City Bulls’ Kaiser Gates at Memorial Coliseum on Friday night. 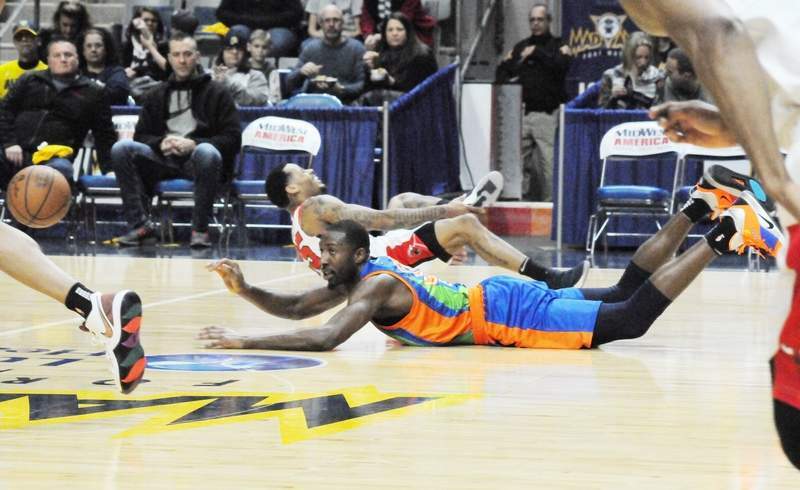 Justin A. Cohn | The Journal Gazette Davon Reed of the Mad Ants, middle, makes pass while on his belly while the Windy City Bulls' Walt Lemon Jr., top, winces in pain at Memorial Coliseum on Friday. Justin A. Cohn | The Journal Gazette Omari Johnson of the Mad Ants backs down Walt Lemon Jr. of the Windy City Bulls at Memorial Coliseum on Friday night. Justin A. Cohn | The Journal Gazette The Mad Ants' Jordan Barnett rips down a rebound at Memorial Coliseum against the Windy City Bulls on Friday night. For V.J. Beachem, stepping on to the Memorial Coliseum court was a reminder that dreams can become reality, even if he hasn't yet fully realized his ultimate goal of making it to the NBA. 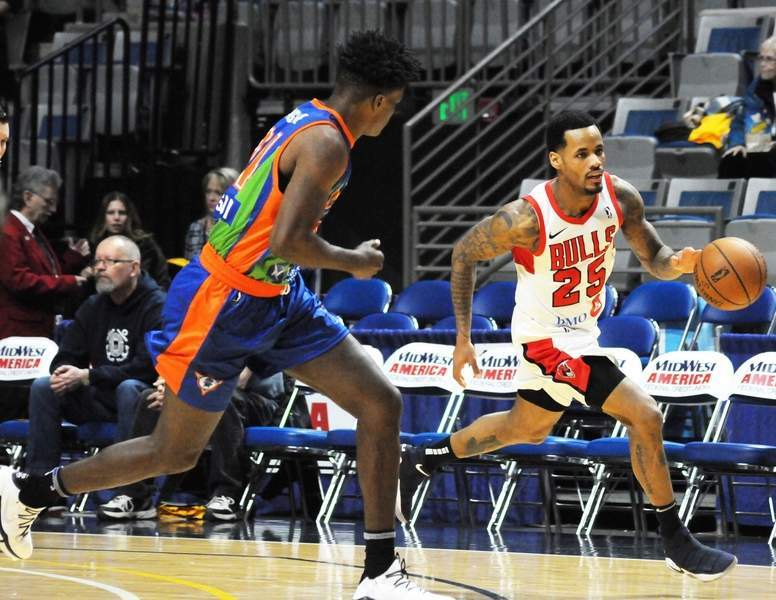 For the Mad Ants, stepping off the Coliseum court Friday was a reminder that nothing is going to be handed to them by Beachem's Windy City Bulls, who have been jockeying for command of the Central Division with Fort Wayne. The Bulls defeated the Mad Ants 116-98, paced by Kaiser Gates' 24 points and JaKarr Sampson's 23 points and 10 rebounds. 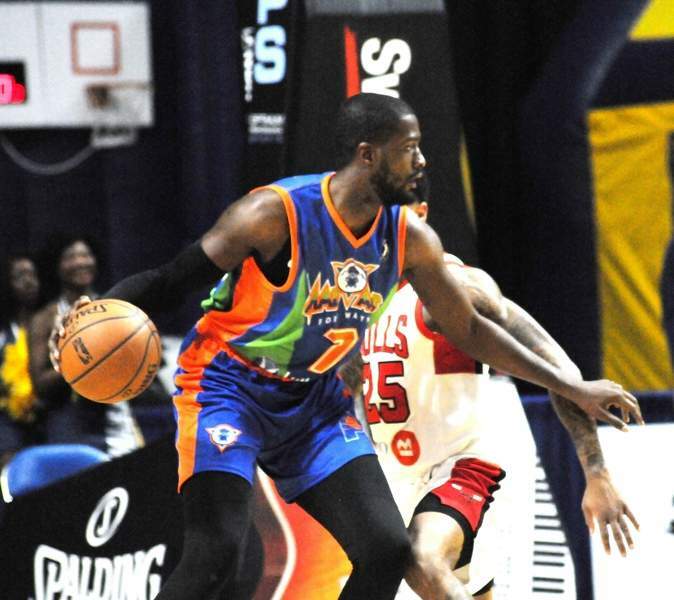 Former Mad Ants star Walt Lemon Jr. had 15 points, nine assists and eight rebounds, as the Bulls (19-16) took over first place in division. Fort Wayne (18-16) got 18 points and seven assists from Rob Gray, who made his second start at point guard since Tra-Deon Hollins was waived Wednesday for, according to sources, failing a drug test. Indiana Pacers rookie Alize Johnson had his 19th double-double in 23 games by putting up 16 points in 13 rebounds, and Omari Johnson added 15 points. “It means a lot to me being on this court,” said Beachem, a former New Haven and Notre Dame player. “Me and my dad used to come to games back when the Fury (of the Continental Basketball Association) were at the Coliseum. I played one game here in high school. So it just feels like everything is coming full circle. Mad Ants coach Steve Gansey bemoaned the “lack of flow offensively,” which was obvious from the shooting percentage (54.1 for Windy City and 38.3 for Fort Wayne). The Bulls were even without one of their best players, C.J. Fair, who had an ankle injury. Beachem, 24, in his second professional season, had missed his previous opportunity to play at the Coliseum because of an injury. He took advantage of Friday by speaking to the basketball teams at New Haven, then scoring five points with seven rebounds and two steals over 33:53 in the victory. 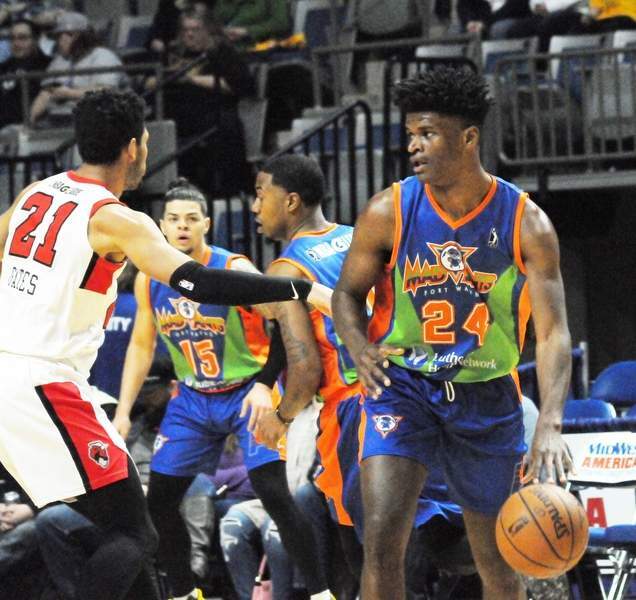 On Indiana Donor Network Night, the Mad Ants honored Beachem's former high school teammate Steve McElvene, who died while a player at the University of Dayton in 2016 of hypertrophic cardiomyopathy, a heart condition. The day before McElvene died, he made the decision to become an organ and tissue donor.